This attractive member of the Pea family will be very familiar to motorists, because so often it forms patches of bright yellow flowers that spill out from the cracks between roadside kerbstones. On some motorway verges an alien form of this plant has been introduced. A sprawling perennial plant, Lotus corniculatus rarely grows taller that 15cm unless it has other plants to lean on, when it can reach 30cm or so. Slipper-shaped in side view, the yellow flowers, each typically 10 to 16mm long, are are borne in tightly-packed heads of between two and seven. Each flower has five petals, although that is not immediately obvious; one petals stands upright, two more form the wings, and a further two smaller petals are united to form what is known as a keel. This plant is sometimes referred to as ''Bacon and Eggs' because of its red-and-yellow colouring as the flowers are opening. Once fully open, the flowers become more of a uniform yellow, sometimes retaining patches tinged faintly with orange or red. 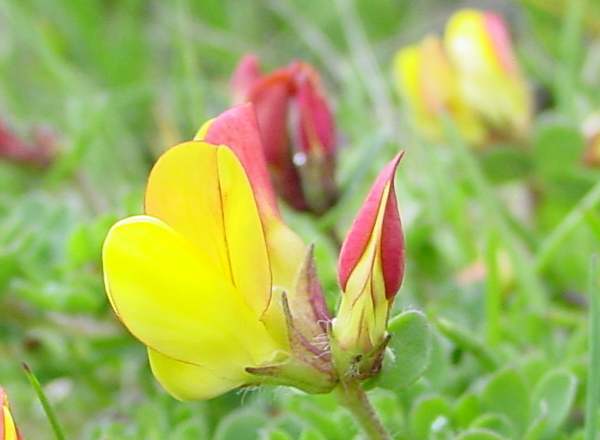 As with other members of the family Fabaceae, seed pods of Bird's-foot Trefoil are long and narrow, usually held in bunches three or more that look (so it has been suggested) rather like the claw-like feet of birds. Each pod holds several seeds (peas, of course! ), and as they dry the pods twist and then split to release their seeds. 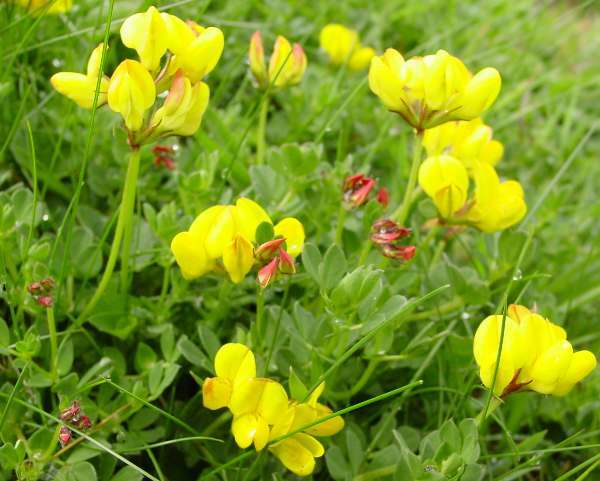 Common throughout Britain and Ireland, Bird's-foot Trefoil can be found in all mainland European countries, too. In Slovenia this colourful wildflower is a common sight on roadside verges and in the meadows. 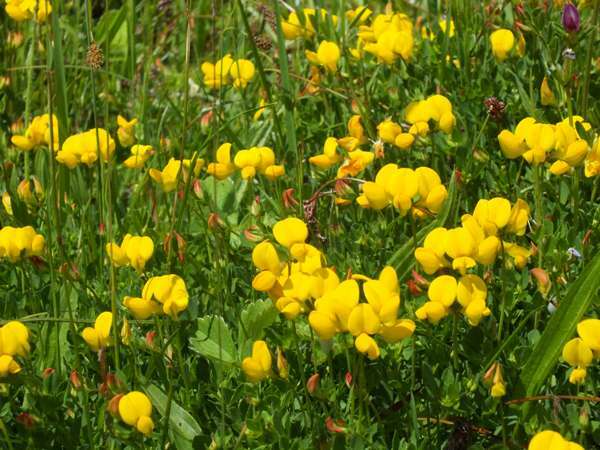 Bird's-foot Trefoil is found in all sorts of well-drained grassland,including wasteland, roadside verges, churchyards, lawns and parks; it even grown on some sandy riverbanks. The first flowers of Bird's-foot Trefoil usually appear in late April or early May, and blooming continues until mid September. Agricultural cultivars of Bird's-foot Trefoil are planted for forage, but to the insect world the flowers are of even greater value, as they are a great source of nectar. Bees love them. Some butterflies and moths uses Lotus corniculatus as their larval food plants. Lotus, the genus name, may come from a Greek word, but it refers to an entirely different plant! The specific epithet corniculatus comes from Latin and means 'with small horns'. Greater Bird's-foot Trefoil Lotus pedunculatus is taller and grows in damp grassland. Its stems are hollow whereas the stems of Lotus corniculatus are solid. The photographs of Bird's-foot Trefoil shown on this page were taken in Wales during May and June.